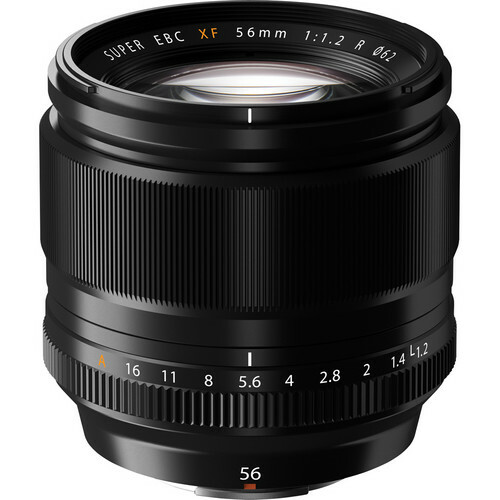 Perfect for portraiture, the XF 56mm f/1.2 R is an 85mm-equivalent prime distinguished by its exceedingly fast f/1.2 maximum aperture for isolating subjects and working in low-light conditions. The optical design employs both aspherical and extra-low dispersion elements, which help to reduce a variety of aberrations, color fringing, and distortion in order to achieve high sharpness and clarity. A Super EBC coating is used, too, to reduce flare and ghosting for improved contrast and color accuracy in bright and backlit conditions. Additionally, this lens also features an internal focusing mechanism for quick focusing performance along with a rounded seven-blade diaphragm to produce a pleasing bokeh quality.